Culture, couture, cruises, shopping, fine dining, naughty nights and amazing memories; Paris awaits you! Stroll the large boulevards lined with quaint and chic boutiques, watch the Seine flow under the magnificent bridges, kick some leaves in the Jardins du Luxembourg or do as the Parisians do, sit at a terrace, order a coffee or a glass of wine and watch the world go by. Always busy but never over-crowded, Paris is a master at re-inventing itself with exciting exhibitions, daring street art, a delicious gastronomic scene and endless evening entertainment options from candlelit dinners on a river boat to cabaret. Give us a call on 01543 499687 and we'll help you choose the best travel option. By ferry and car: take your car on the ferry to St Malo and drive yourself to Paris, approximately 4.5 hours' drive. By ferry and train: travel by foot ferry to St Malo and taxi or walk to the train station. The train journey to Paris Montparnasse station in the centre of Paris is approximately 2.5 hours' long. We will arrange your full travel package from the Channel Islands to the heart of Paris making it a simple and comfortable trip throughout, voila! Make Paris your own, make it extra special and extra easy. At Bontour we can pre-book an à la carte selection of the most popular experiences giving you even more to look forward to. Enjoy a wonderful dinner and show at the legendary Moulin Rouge cabaret including half a bottle of champagne per person. Transport to and from the show not included. Discover the main neighbourhoods and monuments of Paris on this unique tour. This Paris By Night excursion includes a city tour by panoramic coach with a commentary through individual headsets and an hour-long cruise along the Seine River. It offers the ideal opportunity to experience the magic of Paris as night falls. You must make your own way to the tour. Visit Paris in an open top bus with audio commentary. Buses depart every 10 minutes. Hop on and off at over 50 stops and discover the great monuments: Opera House, Champs-Élysées, Arc de Triomphe, Eiffel Tower, Louvre Museum, Notre Dame Cathedral, Hotel des Invalides, Bastille. The Paris Museum Pass will allow you free entry, without queuing and as many times as you like, to more than 60 museums (permanent collections) and monuments in Paris and the surrounding region. Some of the highlights include: The Paris Museum Pass includes entrance tickets in about 50 monuments and museums, among the followings : Notre Dame de Paris Towers, Arc of Triumph, Panthéon, Rodin Museum, Pompidou Center, Versailles Palace. Thanks to your priority access, you can skip the line and speed up by elevator to the 2nd floor of the Eiffel Tower, Paris's most unmissable monument at 1,063 feet high. Take in the magnificent 360°views of the city and explore this iconic monument at your own pace. Dominated by the white Sacré-Coeur basilica, Montmartre is often referred to as a village, complete with its own grapevines and the only funicular in Paris. From the top of the hill, admire the panoramic views of Parisian roofs and indulge in the popular atmosphere on the Place du Tertre which has been home to artists, caricturists and musicians for as long as Paris has been a cultural hub. Then walk down to the world famous Moulin Rouge cabaret, taking in the many arty shops on the way... watch out you're now in the saucy Pigalle district! The largest avenue in the capital, the Champs Elysees offers great strolling, shopping and dining opportunities. Stretching between The Egyptian Obelisk on the Place de la Concorde and the Arc de Triomphe on the Place Charles de Gaulle, the Champs Elysees is lined with restaurants, cafés, flagship stores, luxury boutiques and some of Paris top museums - Grand Palais, Petit Palais, Palais de la Découverte and the Espace Culturel Louis Vuitton. Paris' most iconic monument, the Eiffel Tower stands proud and beautiful in one of Paris' manicured park - the Champs de Mars. It is well worth taking the time to walk around, not just under the tower, and admire its wrought iron lattice structure from different perspectives. Photo opportunities with the tower in the background are potentially at their most romantic from across the Seine, in the Jardins du Trocadero by the lovely water fountains. Le Marais quarter is so many things at once! Magnificent architecture - Place des Vosges - flirts with uber trendy art shops and independent designers boutiques, many of which are, unusually for the capital, open on Sunday. Historically the oldest part of Paris, it is still very much the centre, the heart and the soul of Paris. The Musée Picasso is one of Le Marais must visit. Saint Germain des Prés is a busy area of town with an important student influence. The world famous university, La Sorbonne is one of the reasons behind the many bookshops and the relaxed café culture that you will enjoy there. Leisurely browse the 'Bouquinistes' or bookstalls on the river quays or stroll hand in hand in the popular Jardins du Luxembourg. This is where you arrive when you travel by train from St Malo. Montparnasse is a wonderful mix of bretons creperies and fruits de mer restaurants, of cinemas and theatres and of locals and visitors. Montparnasse is a lively area, a popular destination for Parisians by day for shopping and by night for entertainment. The Tour Montparnasse is hosts to a good department store, including a small but very convenient 'Galeries Lafayette'. Preparing for a no deal Brexit, how does this affect you? In the unlikely event that the UK leaves the EU without a deal, after 31 October 2019 new passport rules for travel to Europe will apply. You may need to renew your passport earlier than expected. All UK passport holders (including Guernsey and Jersey passport holders) should make sure their passports have at least 6 months validity remaining on the date they arrive in Europe. If you are planning to drive in the EU, you may also need a green card from your insurer and International Driving Permit. Please click here for further information from States of Jersey, States of Guernsey and GOV.UK. And as always, please ensure you have adequate travel insurance. Take the train from St. Malo to Paris! 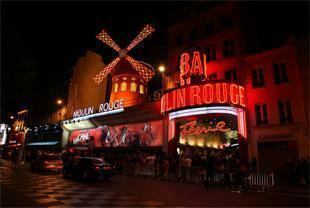 Enjoy the most famous cabaret in the world!